LinnStrument feels like a proper instrument and really helps to bring sounds to life. Loads of fun. Inspiring to play. Roger Linn's influence upon the electronic music world and beyond is nothing short of legendary. We've always been big fans of his designs and we currently own an MPC3000 and Tempest. Roger's latest instrument, the aptly named LinnStrument, is a 'three-dimensional' MIDI control instrument, built with expressive performance in mind. It's very sturdily built with a metal chassis, 200 3D-sensing RGB-backlit pads, eight RGB-backlit switches (two of which are assignable) and it's topped off with lovely cherrywood side panels. The feeling of high quality pervades throughout and the all-important three-axis, multi-touch surface is made from translucent silicone rubber, which is inviting to play and feels great under the fingers. It's grippy enough so you can play accurately but smooth enough so you can perform slides easily. All the connections are found on the right-hand side. From left to right you have a multi-voltage power connection for an external supply, standard MIDI In/ Out connectors, USB for receiving power from your computer (and for simultaneously transmitting/receiving MIDI data) and a footswitch jack that can work with standard single/dual footswitches and which is assignable as a sustain pedal or to other functions. There are also four strap connectors included, so you can wear the LinnStrument on stage - it's always nice to have instruments you can wear and, with all the glowing multi-coloured lights on the panel, it will certainly turn heads on stage too! LinnStrument feels nicely balanced when wearing it but it'll sit atop your studio desk comfortably too, though it does have a fairly large footprint. We found it was best placed on our knees, at an angle on a sturdy music stand, or strapped on. "Subtle velocity, timbre and pitch changes are easy and real fingered vibrato and slides are a breeze." The LinnStrument is eminently configurable using the provided OS/ firmware, which is open-source and based on the Arduino platform - great for folks that enjoy getting their programming hands dirty! It also means the LinnStrument should stay very relevant well into the future. 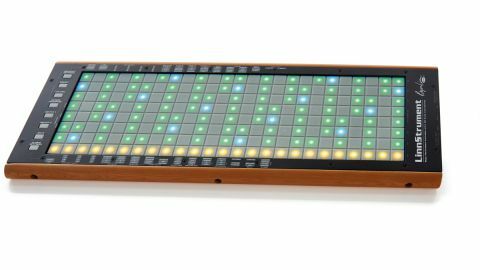 As a rule, LinnStrument's functions are selected and changed by simply choosing a parameter from the printed panel lists and selecting the pad/column that corresponds to the chosen parameter/ function. Across the panels' top you'll find 'per-split' settings (the touch panel can be split at a user-definable point) and at the bottom are global settings. While the default power-on settings work well, you can go in very deep. You can send all notes over a single MIDI channel or for fully polyphonic three-dimensional expression, LinnStrument can send each new touch over a unique MIDI channel, rotating through a block of user-chosen channels. The Channel Per Note mode is particularly practical and allows you to hold down one note while bending or affecting the timbre/pitch of another against it - this is especially hard to pull off on a standard MIDI keyboard and it's perfect for guitar slides against a drone note. You can also set the range of bends between pads (notes), set various pitch quantising options so that you can stay in tune without affecting your pitch slides or vibratos (X-axis), set Timbre (Y-axis), which is changed by sliding up and down on any pad, and finally set the Z-axis (pressure) settings. Roger has included all the features/configurability most users will need, plus CCs can be assigned/sent from the panel too. The 8x25 pad performance panel defaults to a standard guitar layout. However, Roger states he didn't use the standard piano note layout, "because it doesn't permit the intuitive note-to-note pitch bends and slides that the stringed- instrument note layout does". We think this was a wise choice and, although it does take some time to adjust to if you're a keyboardist, you'll soon develop muscle memory for the layout (the learning curve is shallower if you're a guitarist/string-instrument player). Each note in the default setting is always a 4th away from the note directly above or below it and each note within a row is a semitone away from each other, but you can also offset the rows to fit your playing style and display scales too. In default setting, the natural notes are lit green, with all the accidentals unlit. All the Cs are lit up blue too, so you always have a point of reference (you can also customise the panel colours). Performing with LinnStrument is a unique, addictive and inspiring experience! The OS is rock-solid (as is the hardware) and LinnStrument is simply refreshing to use and the results are great. As keyboardists we tend to resort to the same old chords/shapes but LinnStrument made us search for (and pointed us towards) new ideas, something which standard keyboards don't generally push us to do. We really enjoyed being able to slide across the panel or strum it in split mode and it's amazing how you can transform a sound using variance of touch with just one pad. Subtle velocity, timbre and pitch changes are easy to pull off convincingly and real fingered vibrato and slides are a breeze (as on a guitar/violin/bass etc). For playing string or woodwind/brass samples, LinnStrument also brings a new dimension of realism that's sorely missing from keyboard controllers. Also, as the pads/notes are much closer together than on a keyboard, you can span larger intervals easily within one hand too. To sum up, we really dig LinnStrument. It opens up a whole new world of MIDI-controlled performance in an elegant/intuitive way and, although it's basically a controller without an internal sound engine, it still feels like a 'real' instrument. If you are looking for a new way to perform musical gestures that simply aren't possible on a MIDI keyboard (or using a piano-note-layout), then LinnStrument is definitely for you and it's pretty affordable too - a must try for sure!